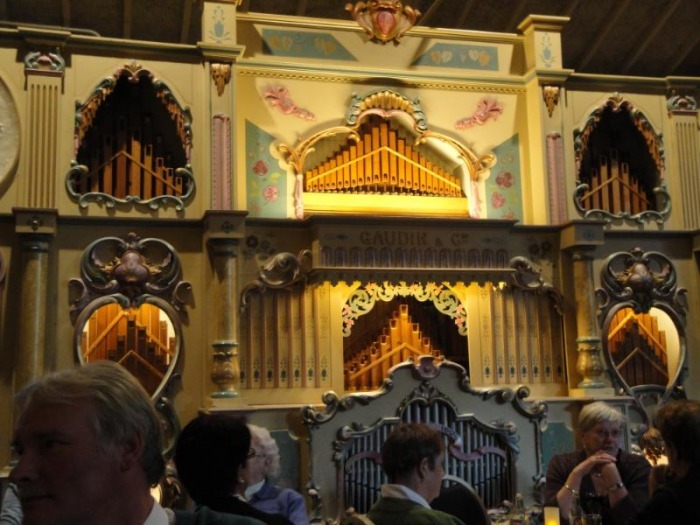 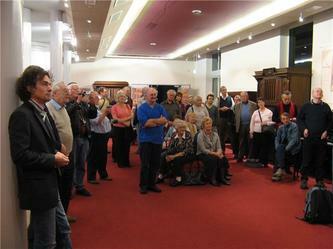 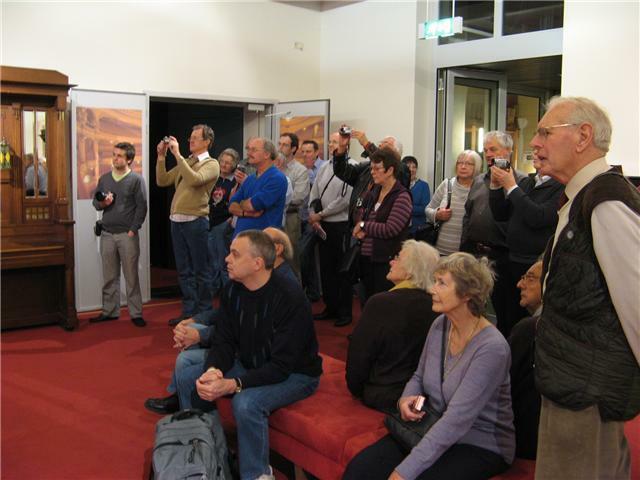 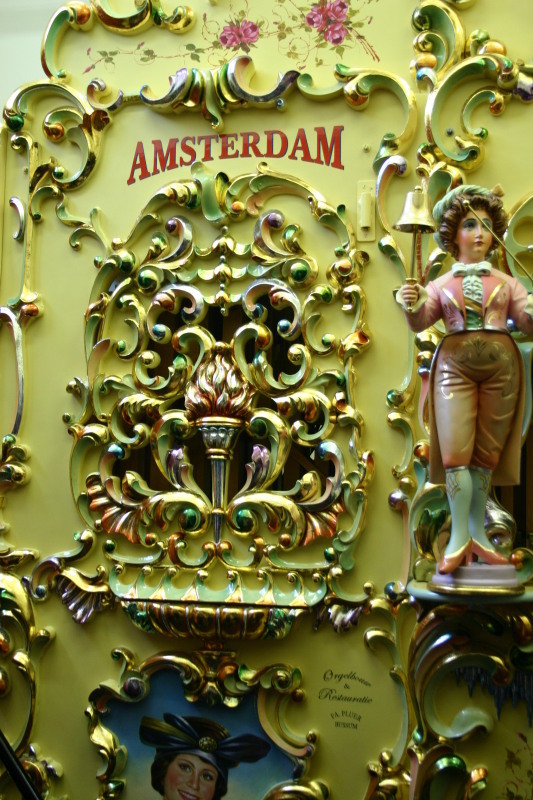 This years MOOS tour was entitled 'Highlights of Holland' and featured the most outstanding collection of mechanical organs found anywhere in the world- The Netherlands. 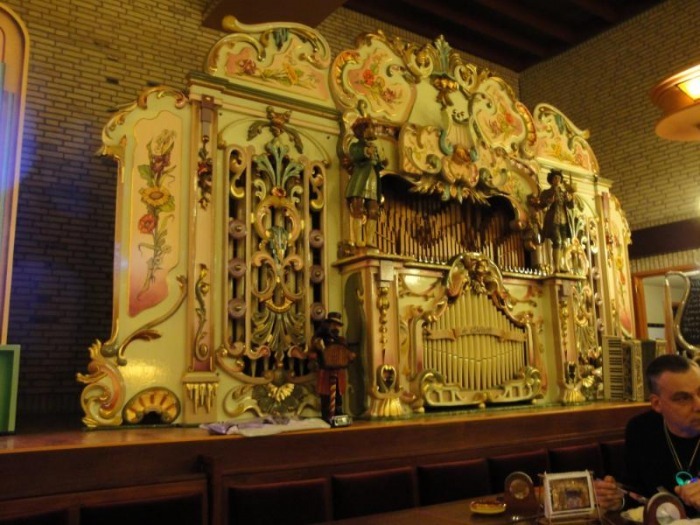 Add to this a coach full of liked minded organ lovers, with good food, plenty to drink, and lots of chat to accompany their holiday, and you've got a legendary MOOS Tour. 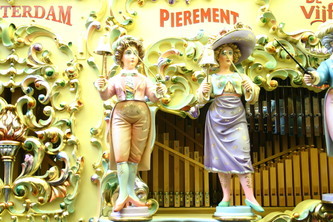 Its Saturday the 14th November and after picking up a bus full, we headed to Dover to catch the ferry. All the way, nervous jokes were made about the weather forecast on Radio 2, telling us it was one of the stormiest days of the year so far. 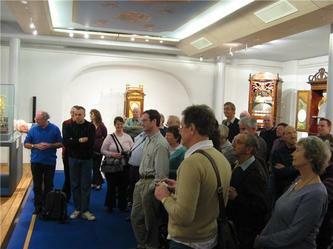 We were also enlightened to hear that 70MPH gales were whipping though the channel. Still, its value for money, as we wouldn't just get a trip on the ferry, but a white knuckle ride to fulfil any adrenaline junkie's needs. 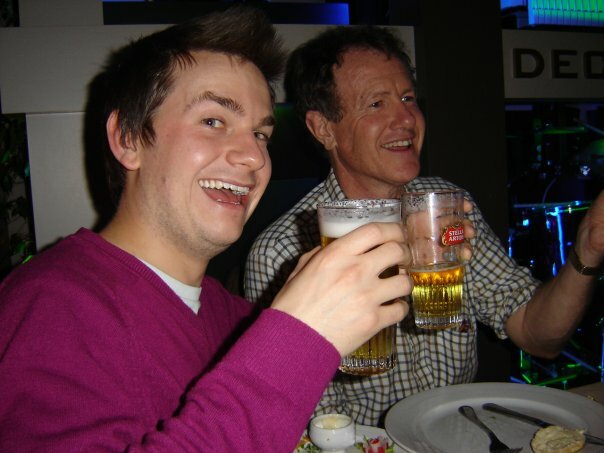 With the weather conditions creating a boiling sea, we decided a Burger King in the Dover waiting area would be a lovely idea, then Shane (our MOOS magazine editor) found out that Costa Coffee were selling bottles of cider. 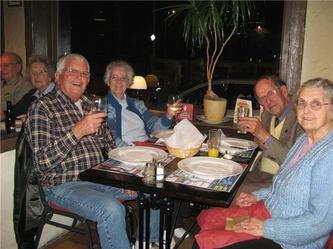 We sat and drank for approximately enough time to make us feel like we were on a rocking boat. 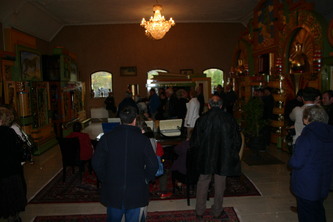 An announcement informed us our Ferry had been canceled. Of course disappointed at the time, we were very relieved later, when we found out the ferry that left Dover before ours was to be stuck at sea until late evening as it was too rough to enter the harbour! I bet those passengers were green! Linda and Boz quickly rescheduled our crossing on the channel tunnel, where we caught up a lot of lost time with a speedy journey across to our first visit- the Cafe Destiny. 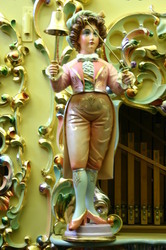 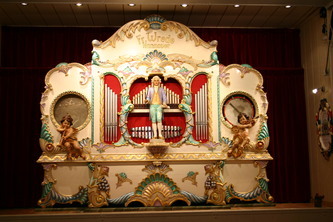 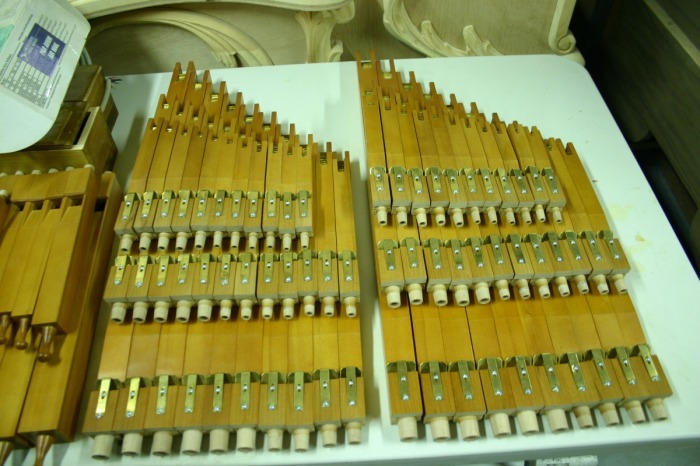 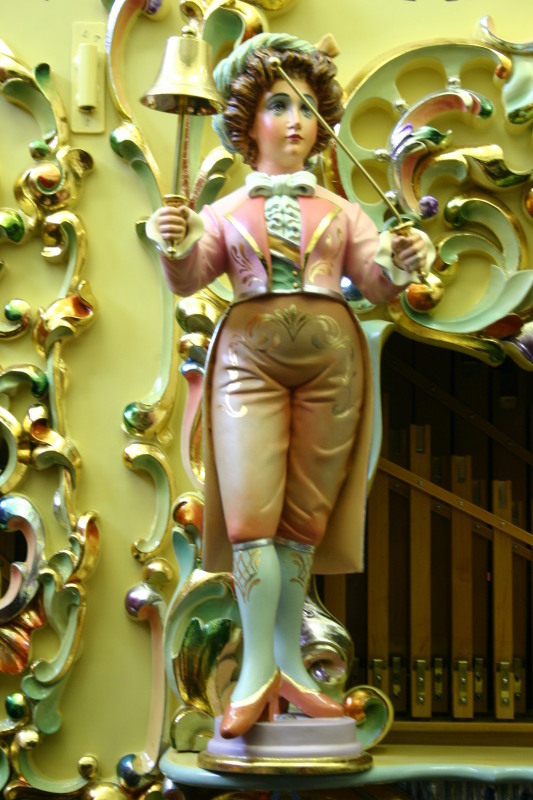 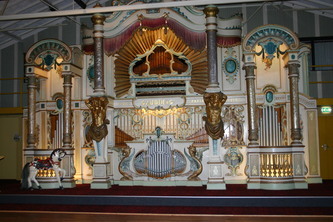 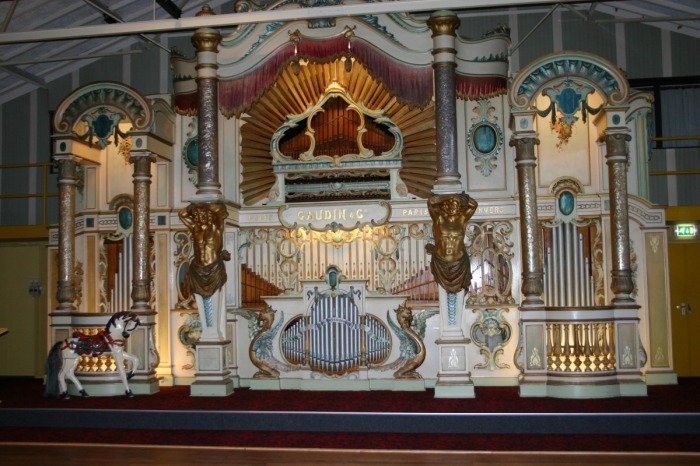 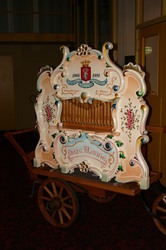 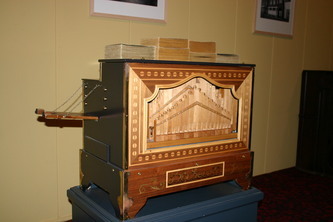 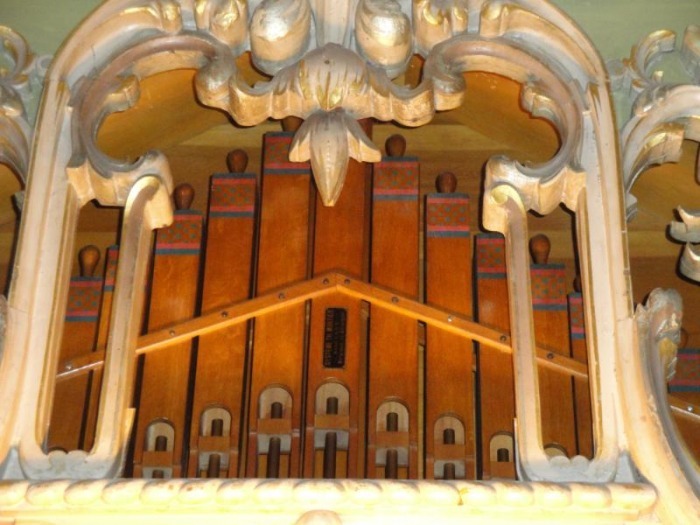 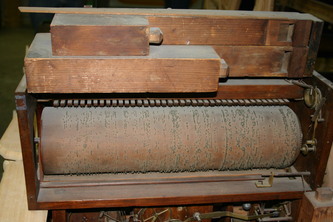 The resident organ is a Decap Hererentals Dance Organ, named Destiny. 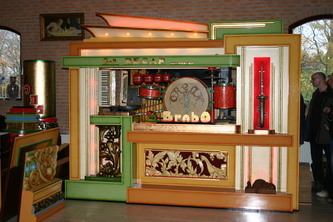 This electronic organ uses MIDI to its full potential, along side a drum kit and some real pipework. 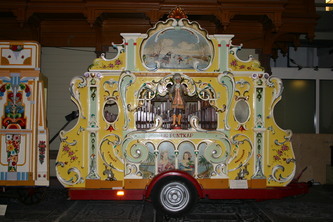 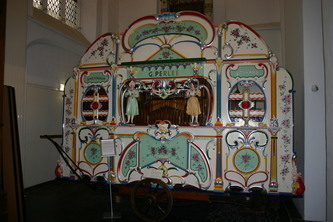 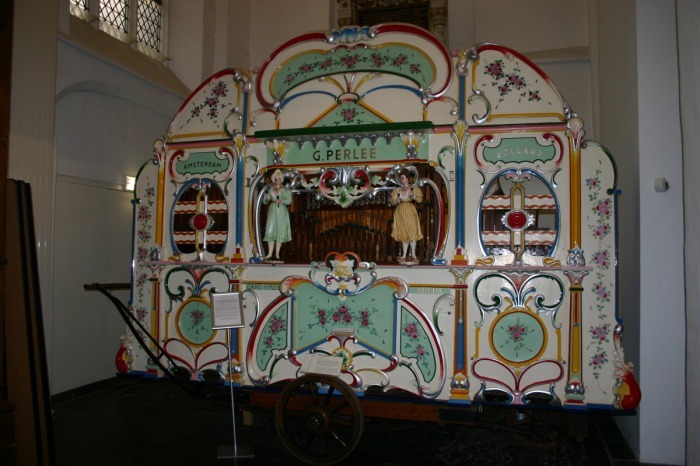 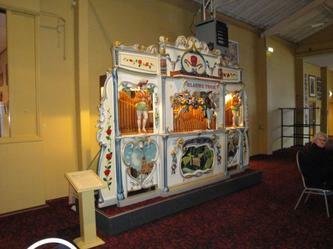 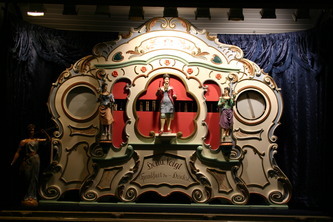 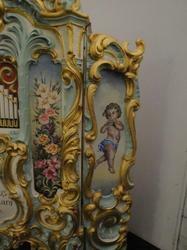 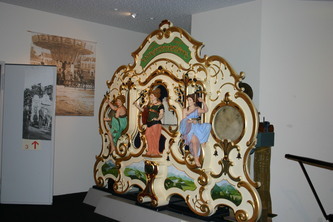 Some of the songs it plays even has a pre-recorded human voice singing along to its merry tunes. 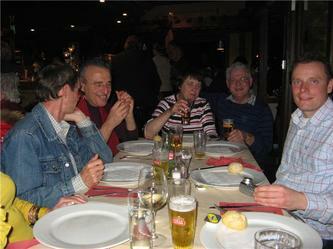 While it played as we munched a delicious dinner, and the locals, who were crowded round the bar area also had a good sing song. A quick stop at the Novotel to drop off our luggage and get our room keys, and then a taxi of party animals take a trip of the Cafe Bevren, which is a bit of a legendary destination. 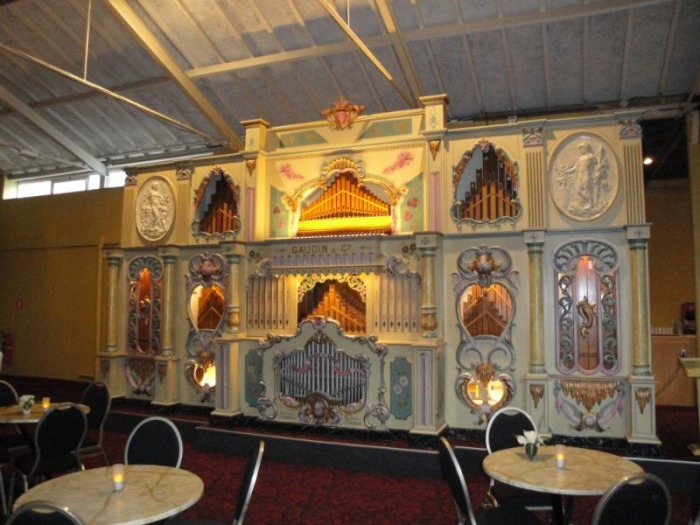 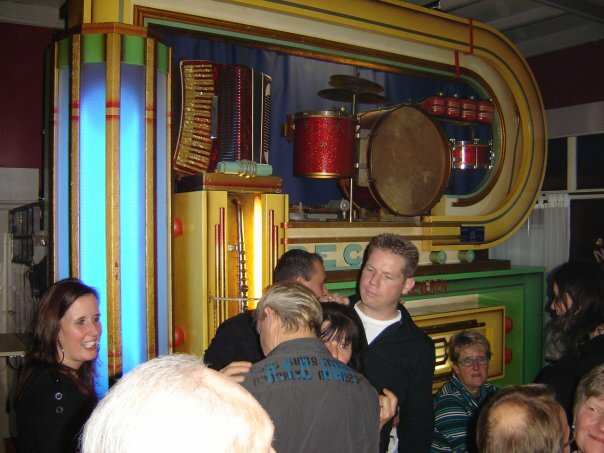 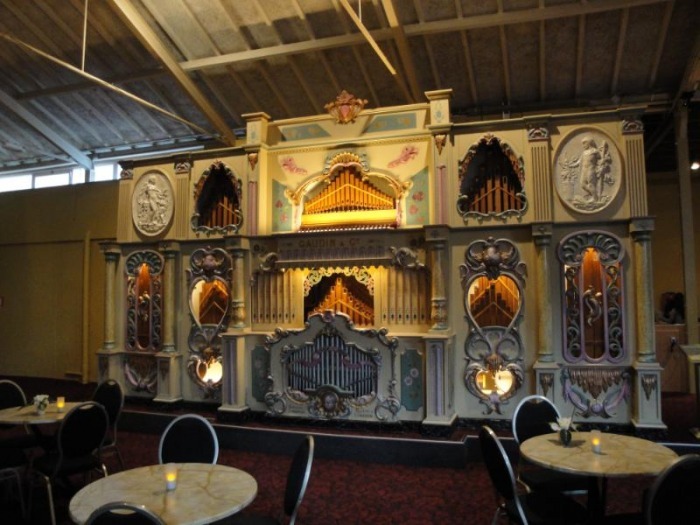 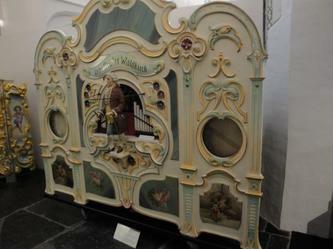 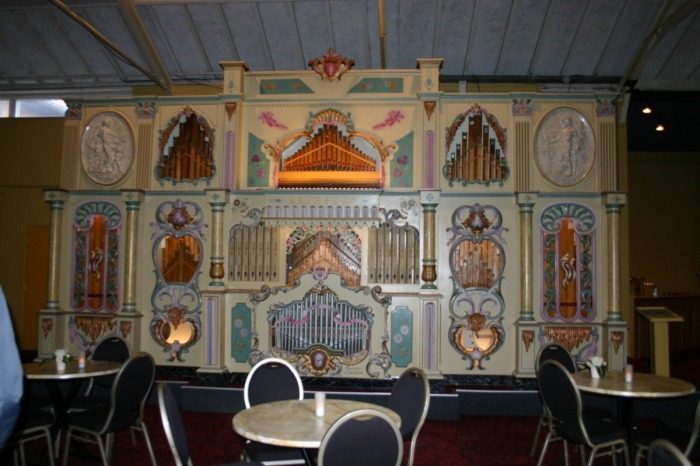 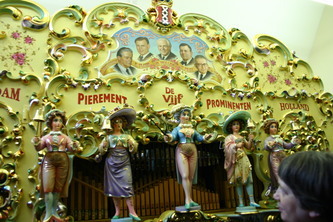 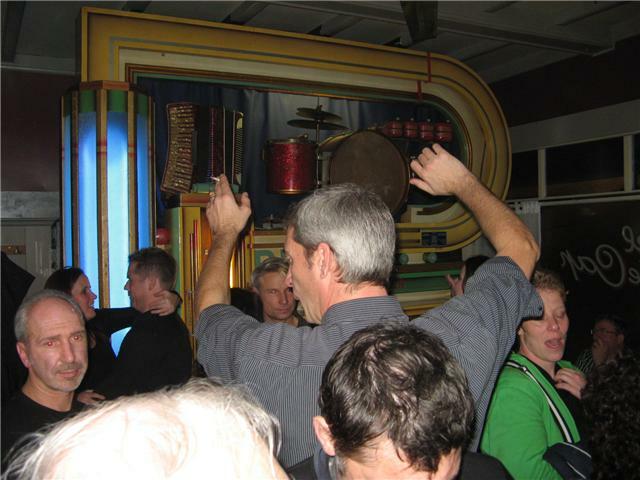 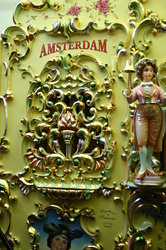 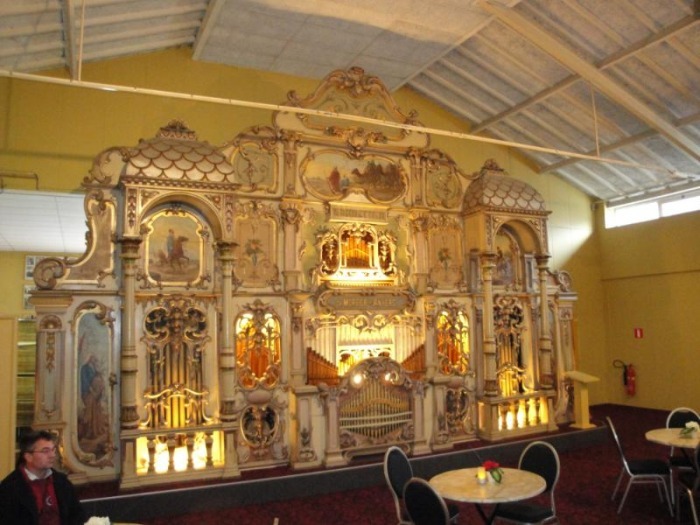 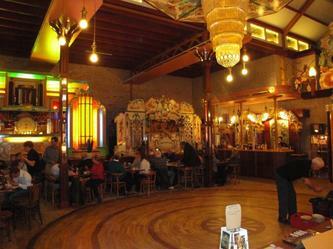 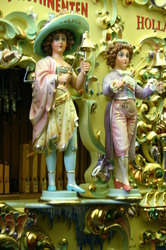 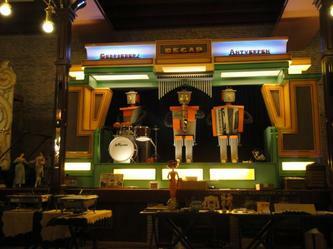 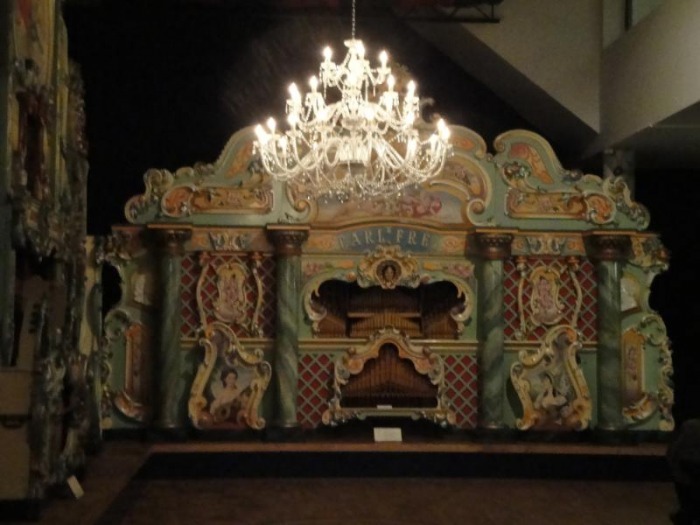 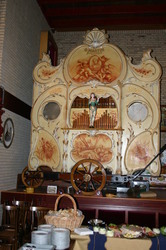 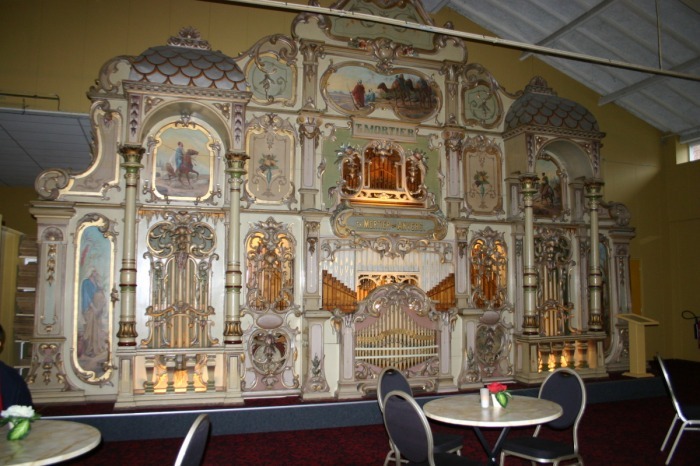 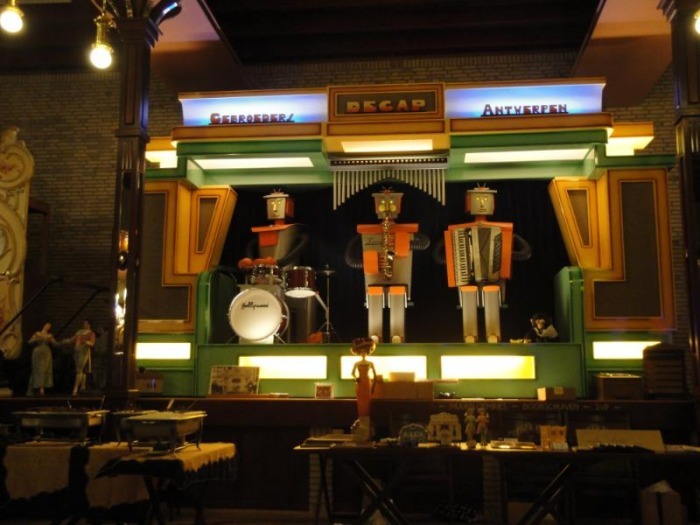 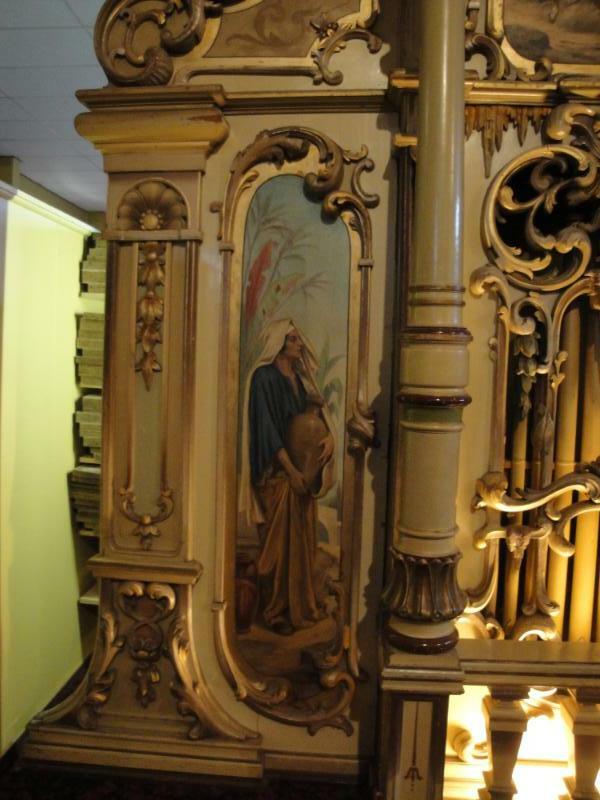 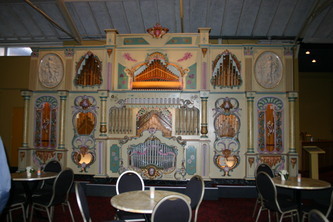 It is one of the last Cafe's in Antwerp to have a resident Dance Organ still in operation. 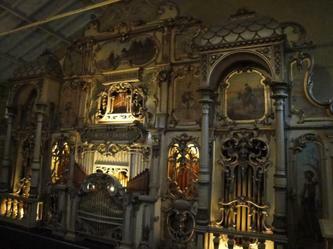 Usually when we take a trip there its pretty quiet, but when we turned up to hear the organ, the place was so packed we couldn't get inside the door! 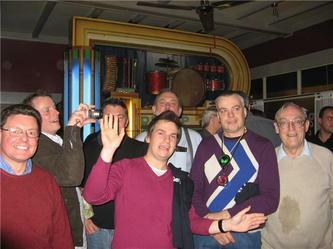 We waited patiently to get to the bar and have a drink, the juke box blaring out some English Oldies like the Beatles and the Who. 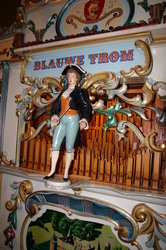 Some brave soul, (probably Peter Craig) discreetly put a coin in the organ box, to which the little Decap came to life, with a blazing rendition of 'Delilah'. 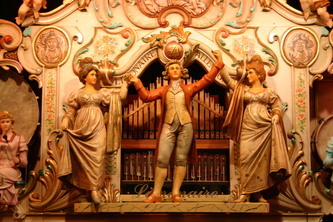 The merry regulars to the Cafe Bevren suddenly faced the organ, cheered, clapped and sang at the top of their lungs. 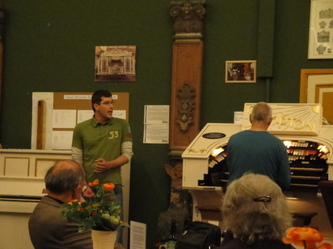 Such a lovely atmosphere, and so encouraging for everyone to still have such a love for the organ. (I think they were particularly delighted that their English visitors we were paying for it to play!) 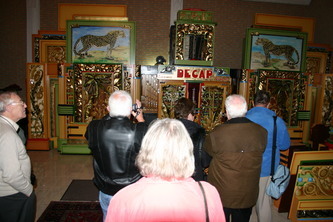 The Decap continued to rattle out more favourites, between more choice oldies from the Juke Box, to keep everyone happy. It's Sunday, not too sure what time we got up but it felt very early!! 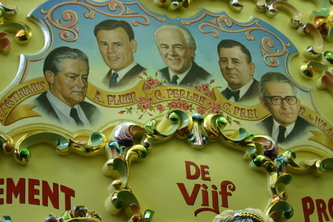 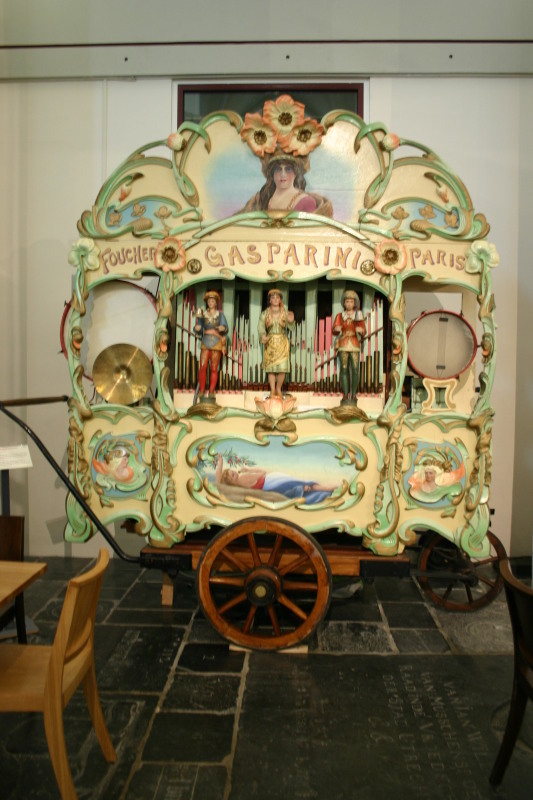 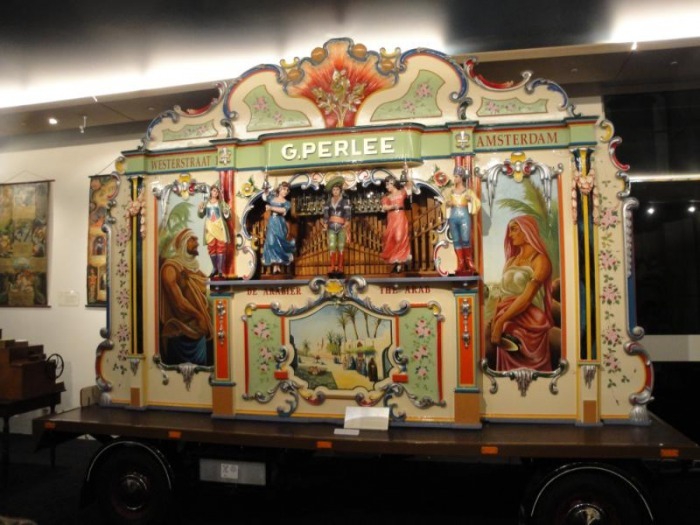 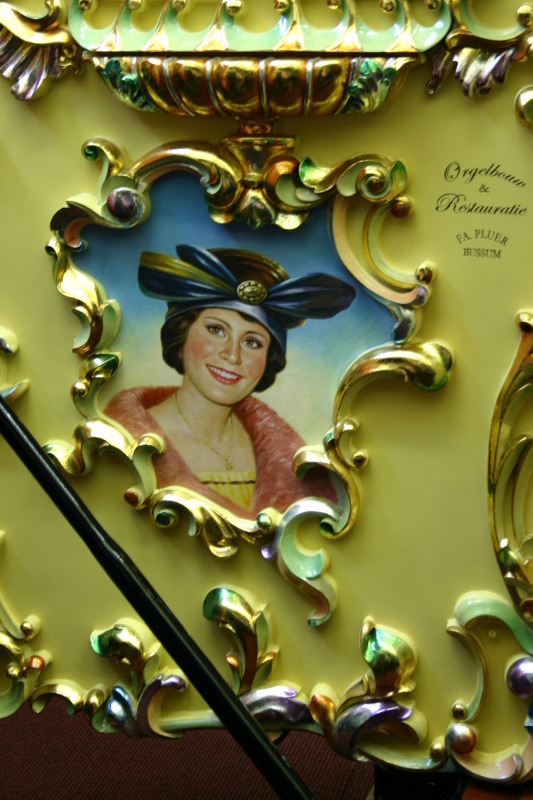 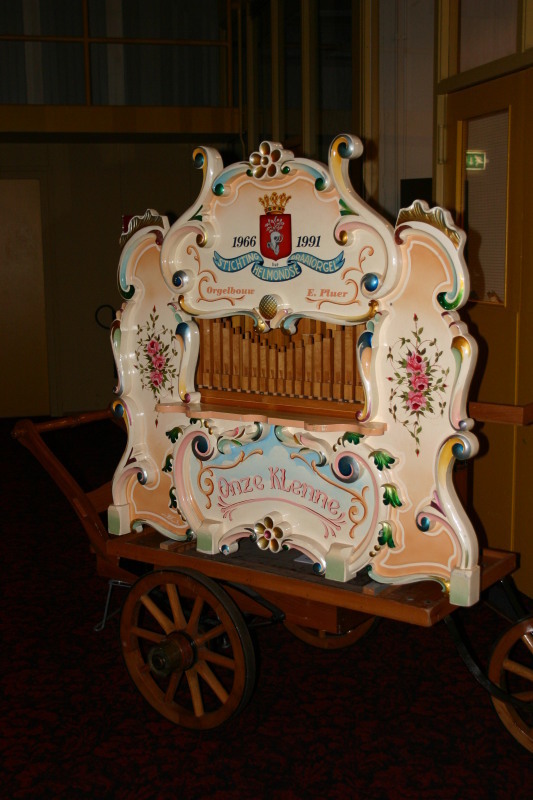 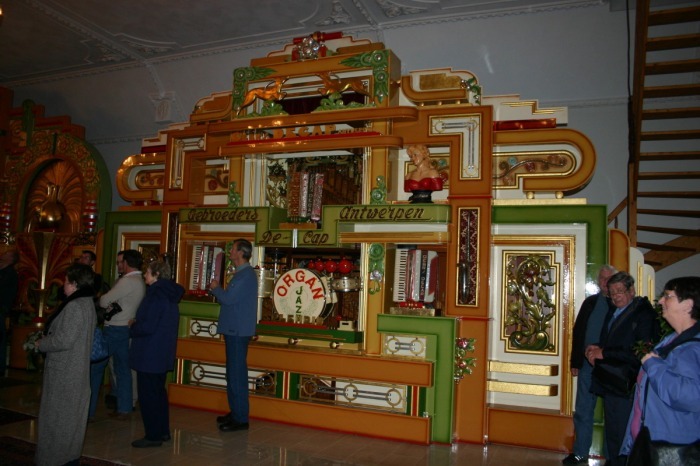 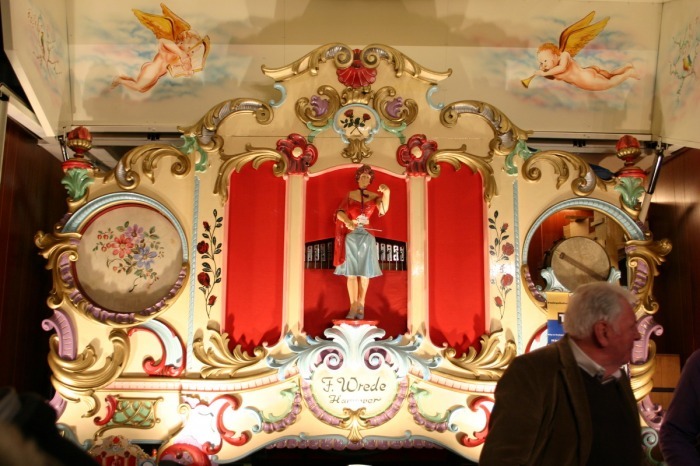 We first headed to the De Voer Family at Ulvenhout who have an open day every year dedicated to fairground organs of German origin. This big warehouse, that is usually used to store their fairground equipment, is transformed into a museum of mechanical instruments, complete with bar and KDV stand selling some excellent CD's and bits. 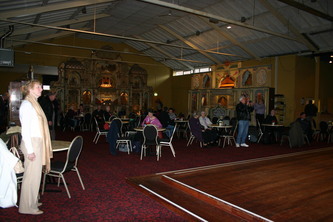 Some of the coach chose to stay there all day, the rest of us got back on the bus to travel down the road to see some other sights. 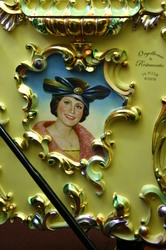 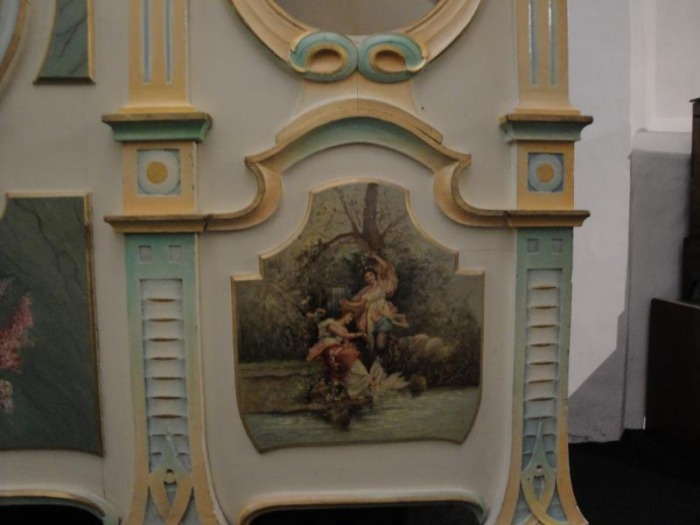 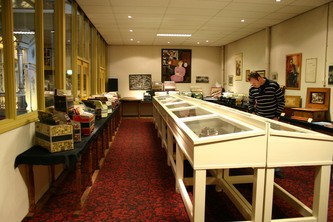 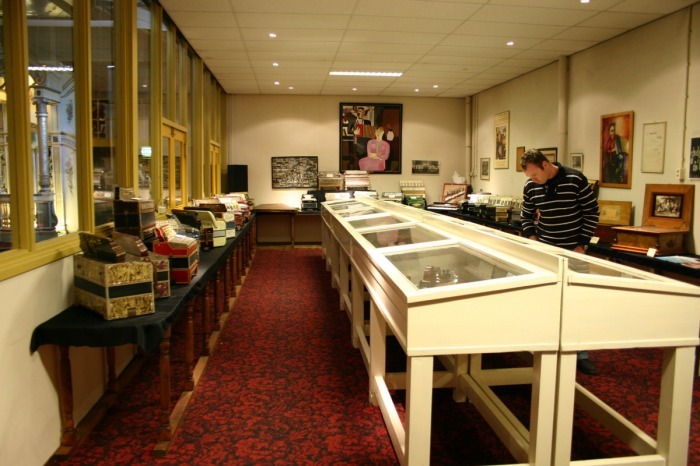 Our next stop was the private collection of Wies Schwagten in Tilburg. 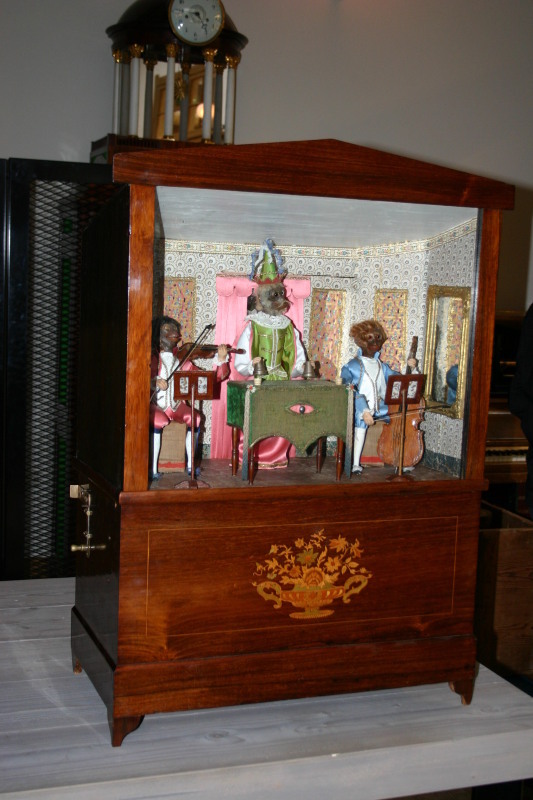 I think more photo's were taken of the palace he lives in, never mind his 'little shed round the back' full of several Mortier and Decap organs, all sitting on a marble floor. All the instruments played flawlessly. Then we moved onto the Gaviolizaal in Helmond, a collection that is now open to the public again after a few years of silence. 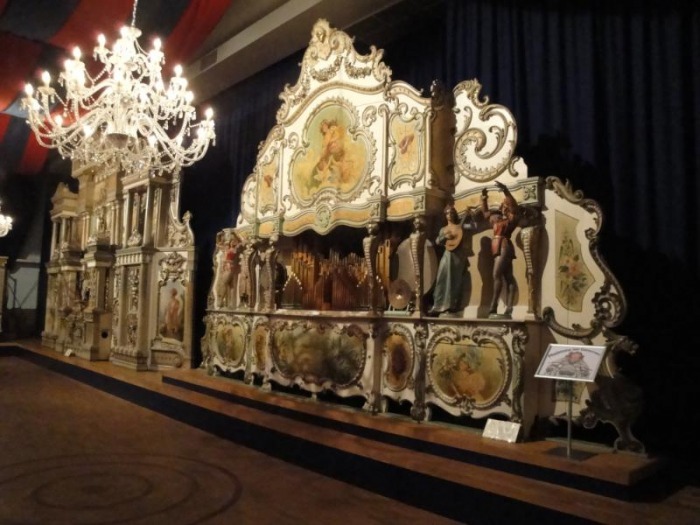 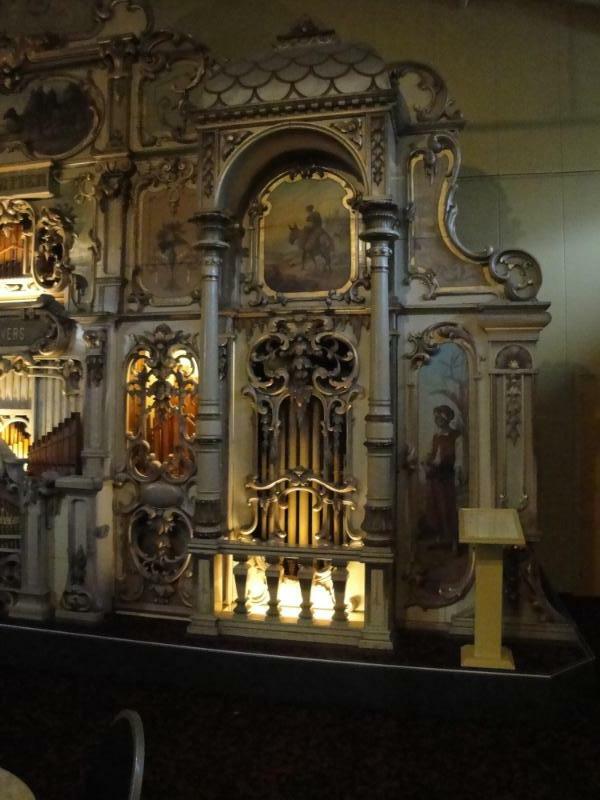 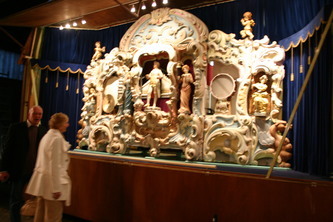 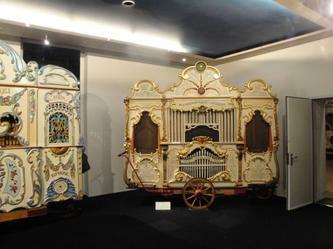 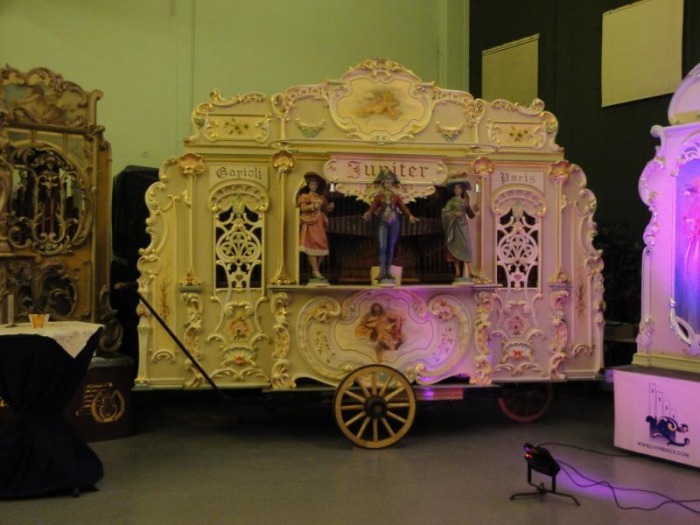 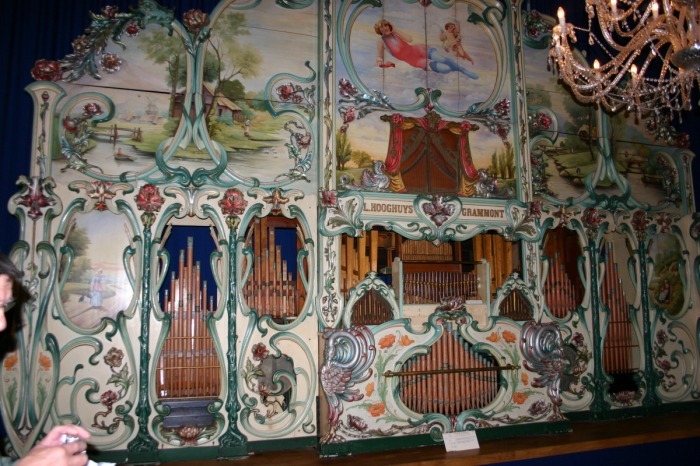 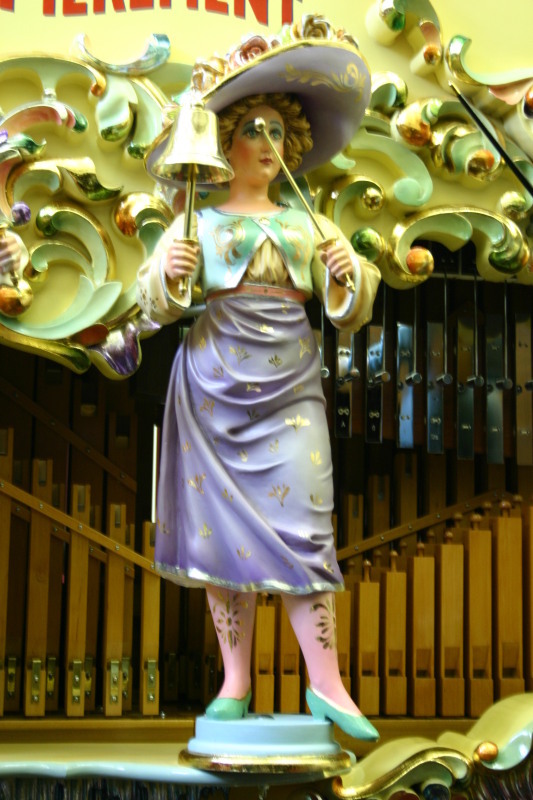 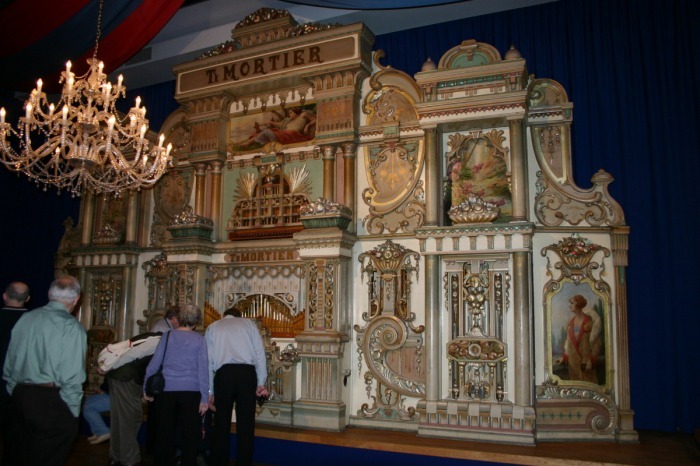 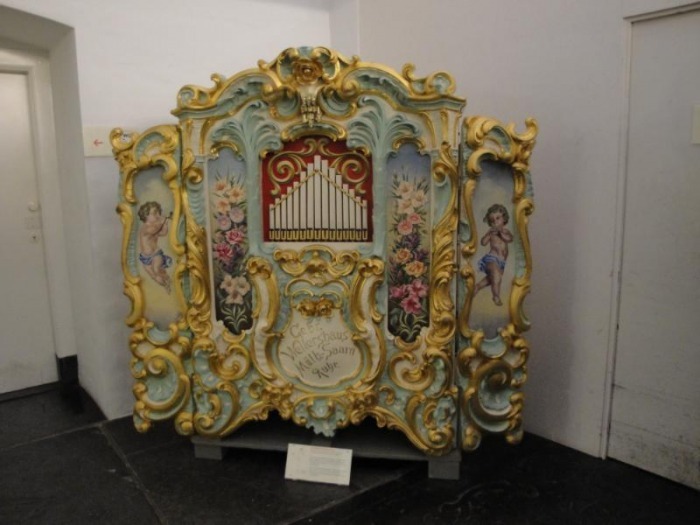 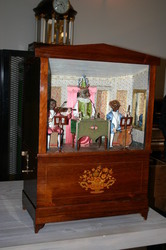 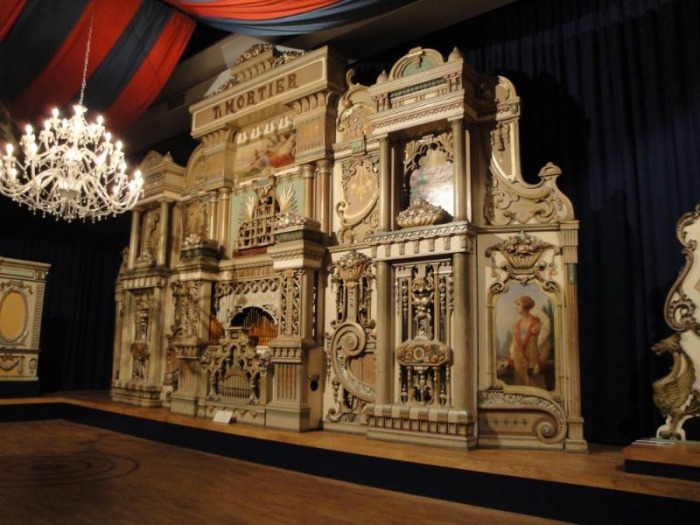 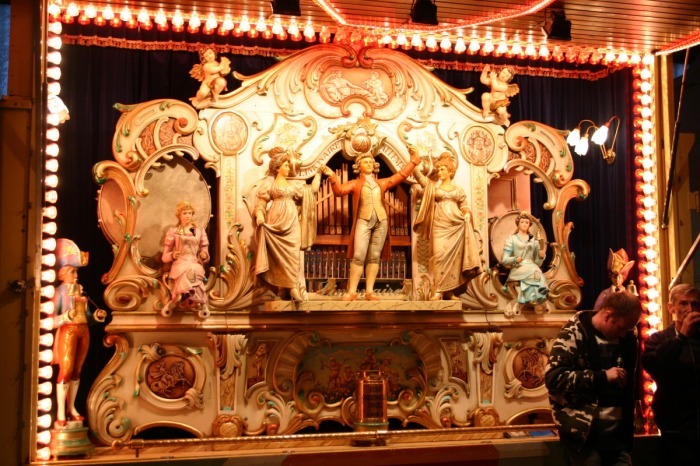 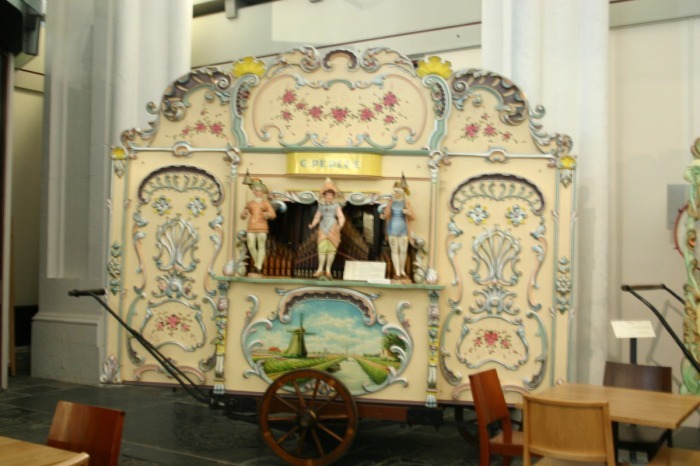 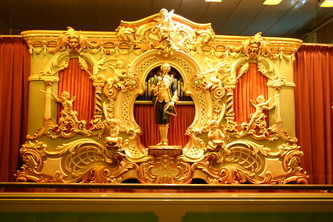 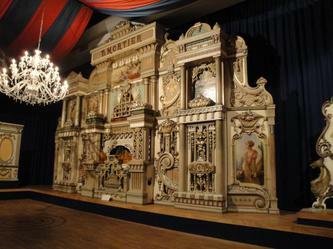 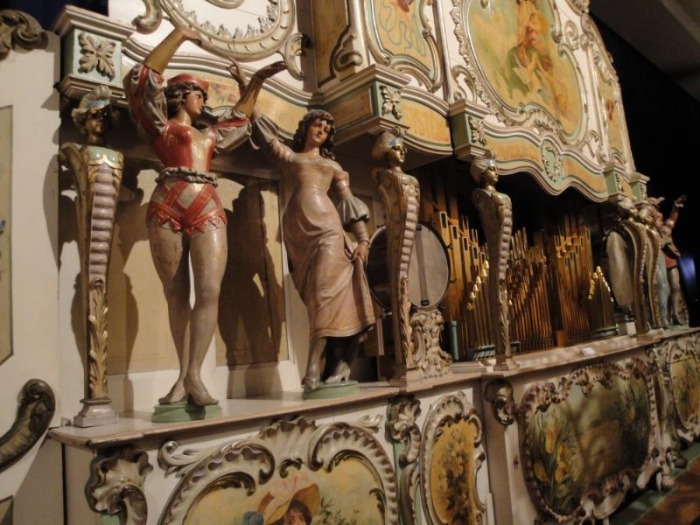 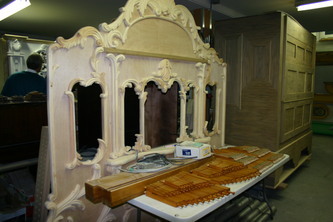 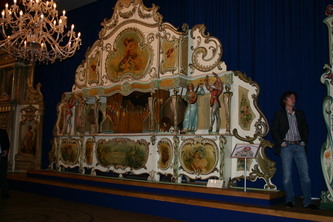 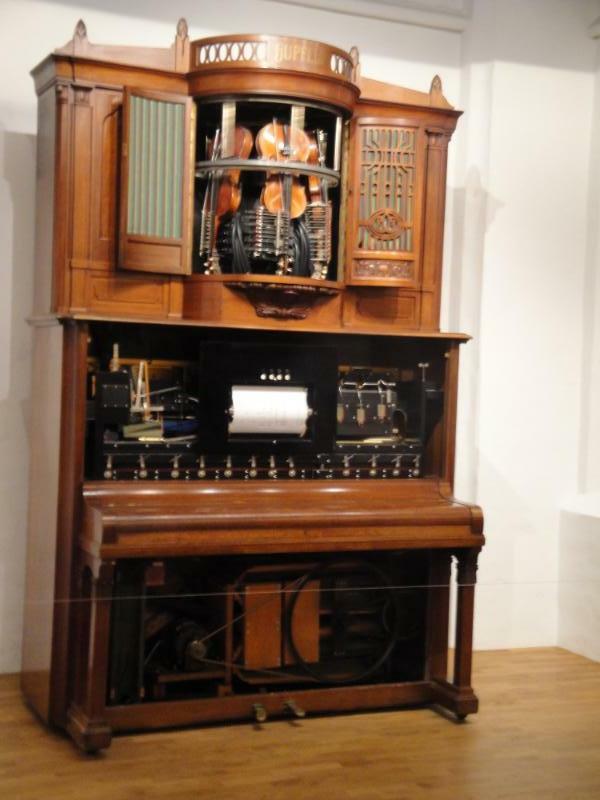 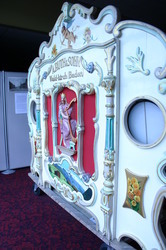 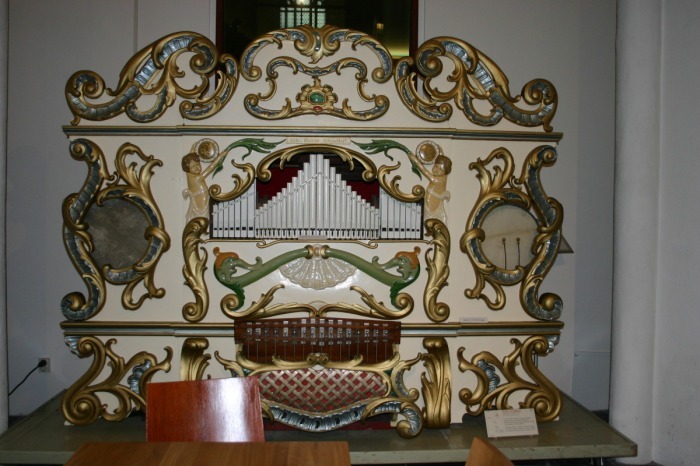 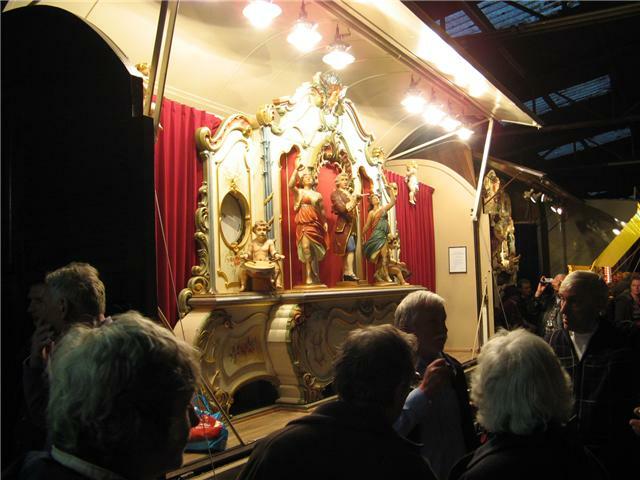 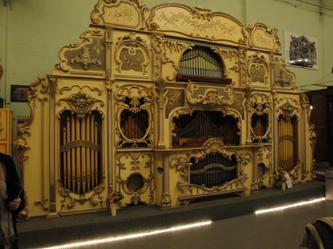 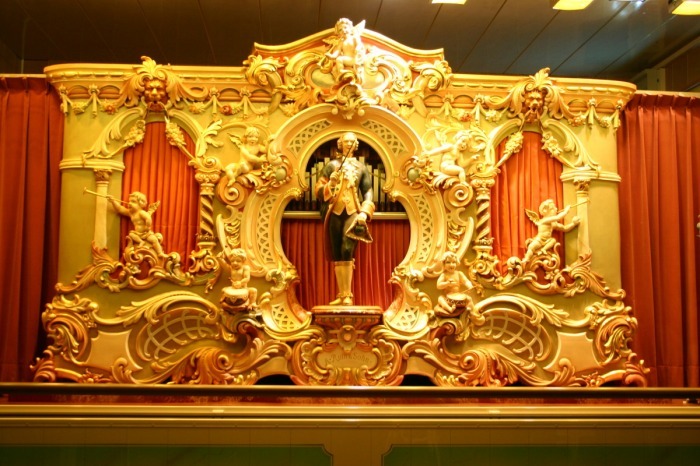 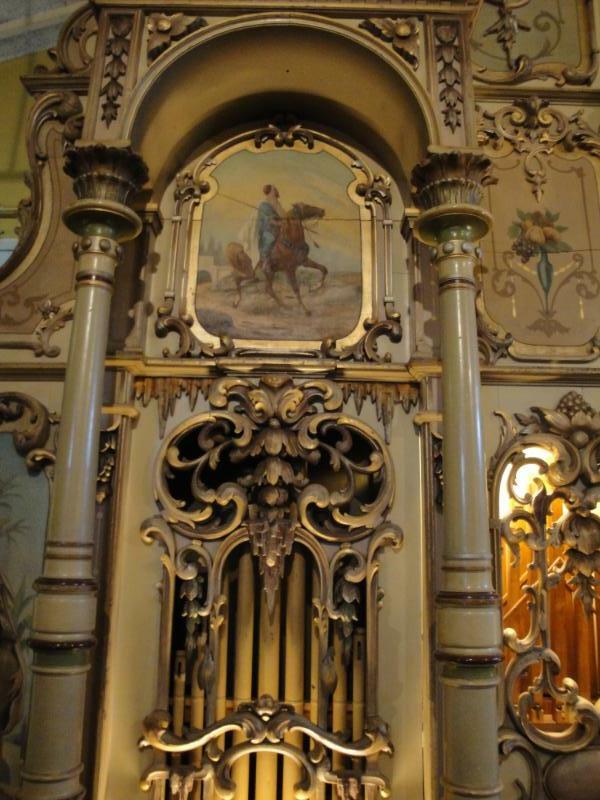 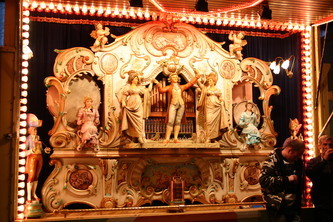 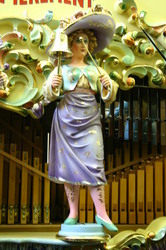 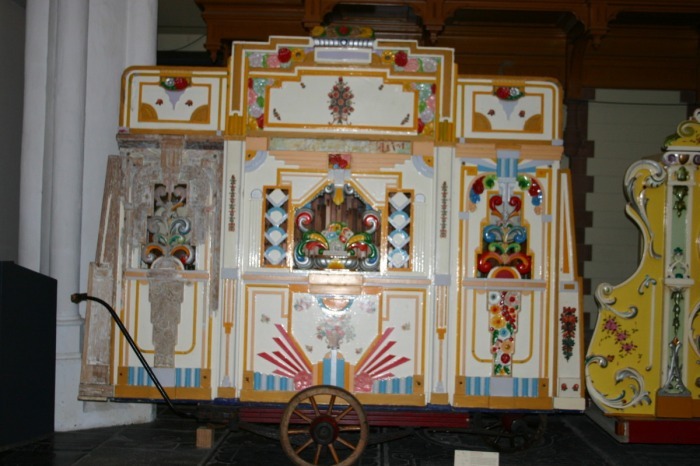 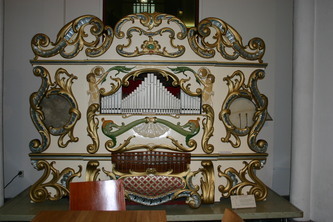 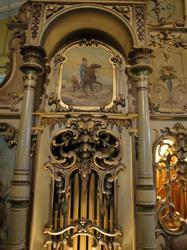 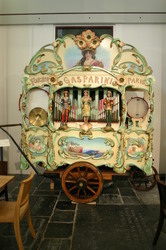 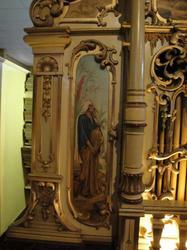 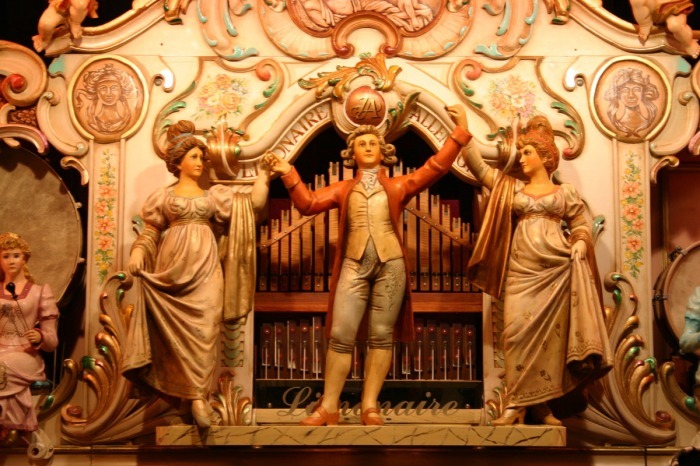 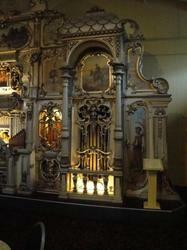 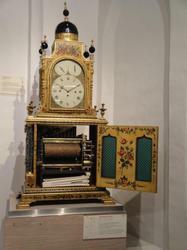 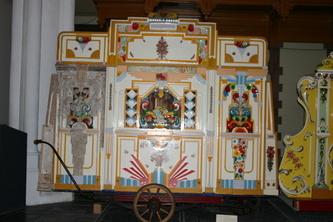 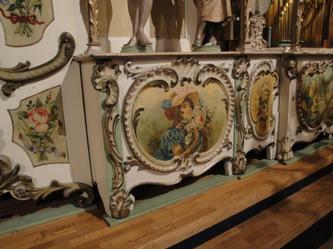 Included were a large Mortier, a street organ and the monumental 114 Key Gaudin Dance Organ as a centre piece. 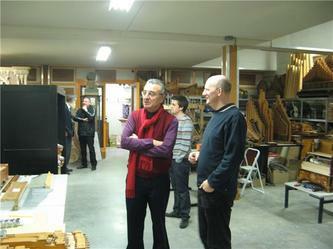 We were able to have a coffee and a beer, and stayed the whole afternoon to listen to the instruments play in turn. 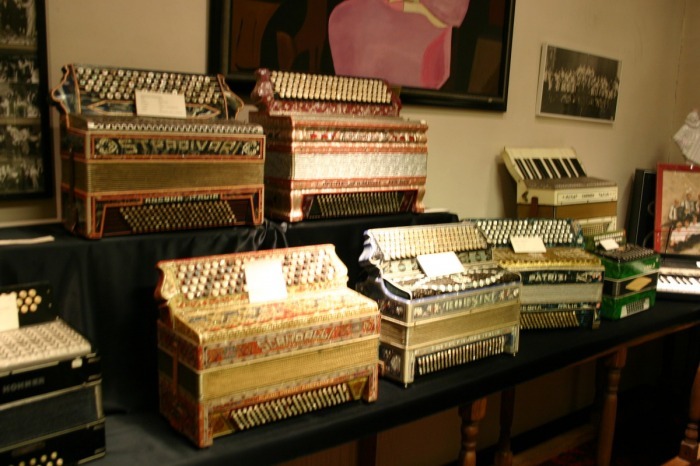 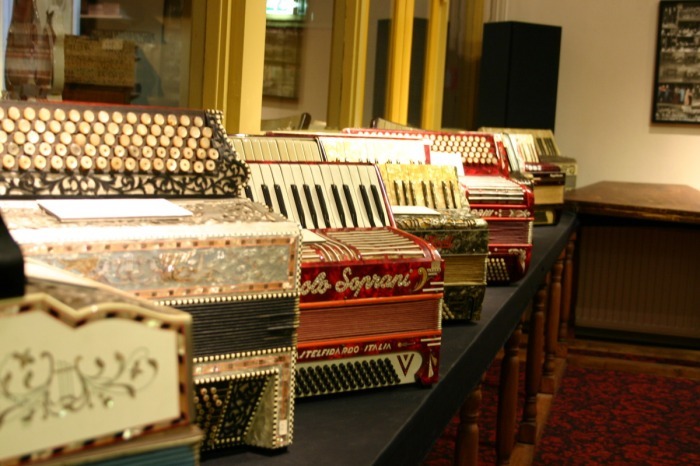 This public display also included a side room with a large display of accordions. Stomachs were rumbling, so onto the collection of Cris van Laarhoven at the 'Dansant' in Hilvarenbeek, where a stunning dance hall has been constructed housing a collection of dance organs, street organs and smaller exhibits. 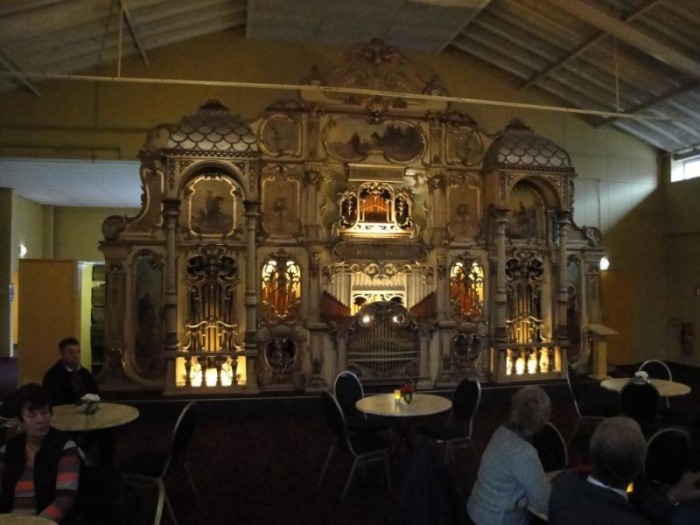 We enjoyed a lavish buffet in the hall, and then were treated to a trip down a spiral staircase to the basement workshops of 'Netherlands Boekorgan Centrum'. 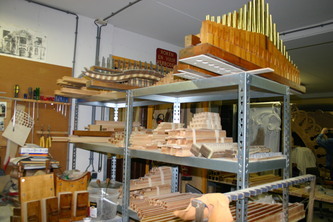 Here we saw all sorts of organs in the middle of restoration, or construction from scratch. 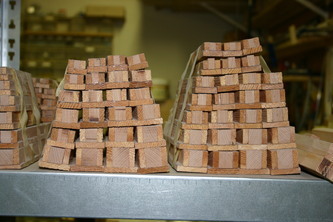 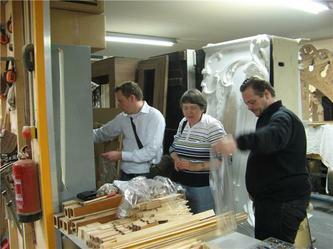 The 101 Key Mortier 'The Fishes' was well underway to completion. 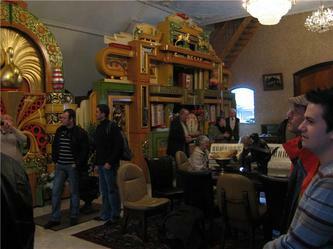 Examples of everything from wood carving to pipe making were all on display for us all to enjoy. 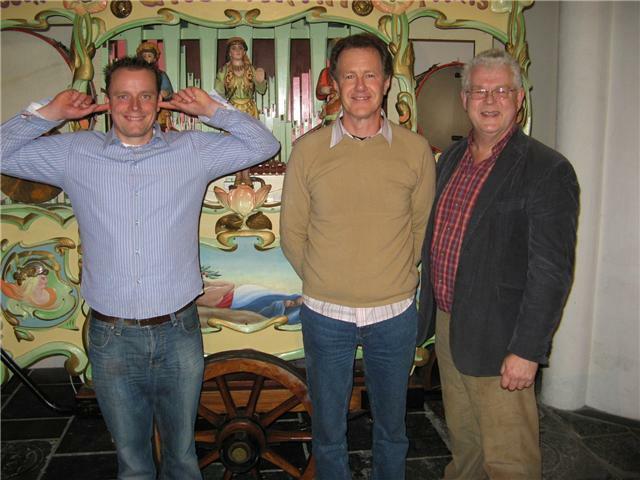 Monday the 16th November, what a treat. 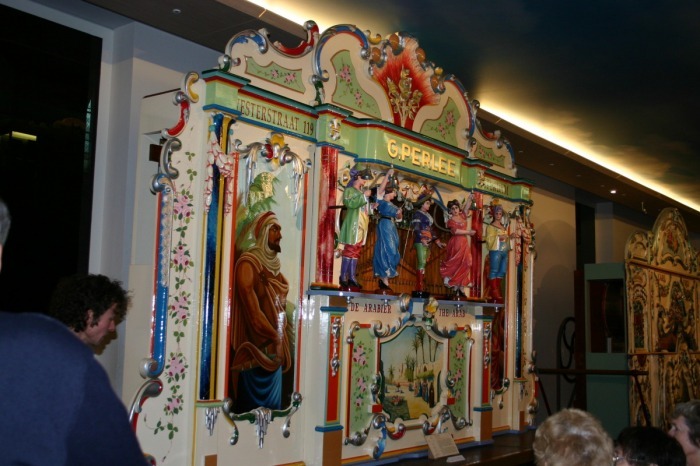 We visit the Museum Van Speelkok tot Pierement in Uterecht. 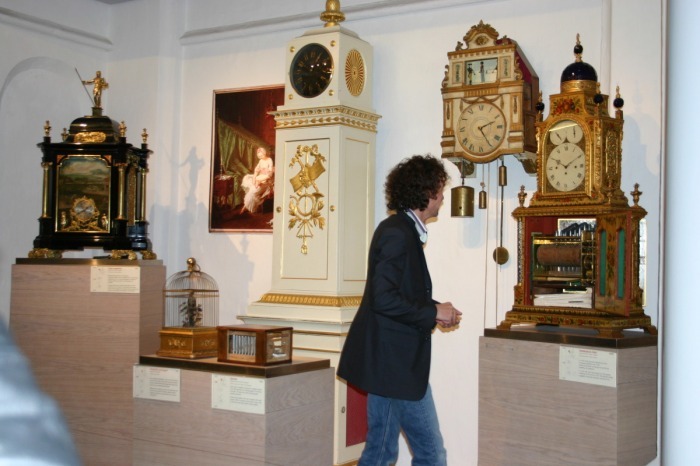 This is the national Dutch collection of mechanical instruments, purchased by the government, put in a converted church, and opened as a museum. Not just the way it was laid out and staffed impressed me, but the exhibits and educational displays for children getting young people Intrigued in mechanical music. 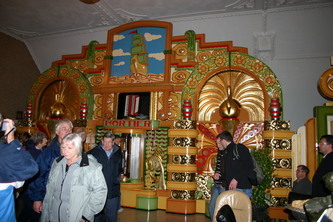 It was all very well thought out. 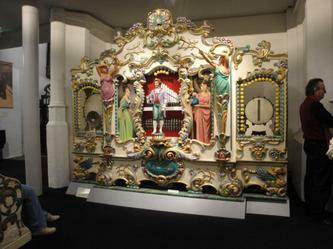 So much money and effort has been spent putting this museum together, which just shows how seriously the county takes mechanical music. If Gordon Brown put money in to an organ museum like this in the UK, I expect the Daily Mail would have something to say about it! 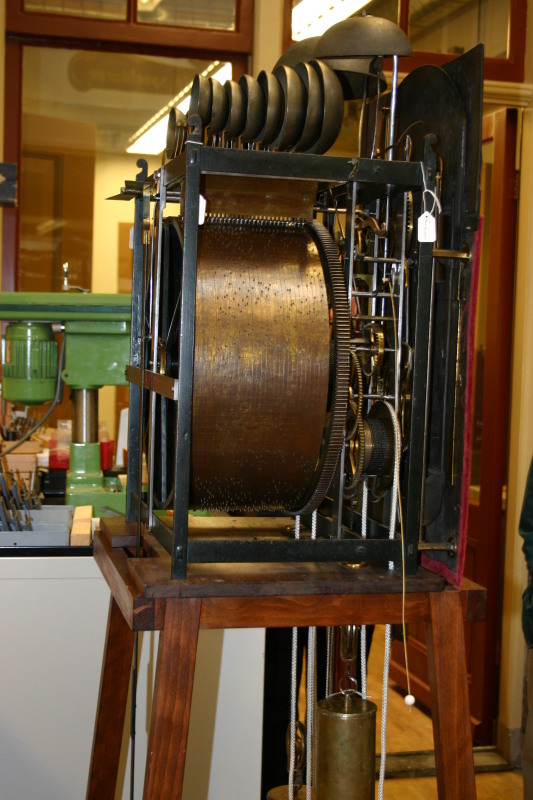 We listened to the instruments at length, starting with one of the first types of mechanical organ- a clock, that played a tune on its pipework via a barrel mechanism. 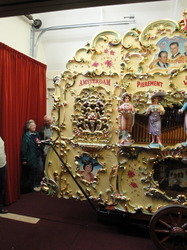 We then went on to see orchestrations, street organs, dance organs. 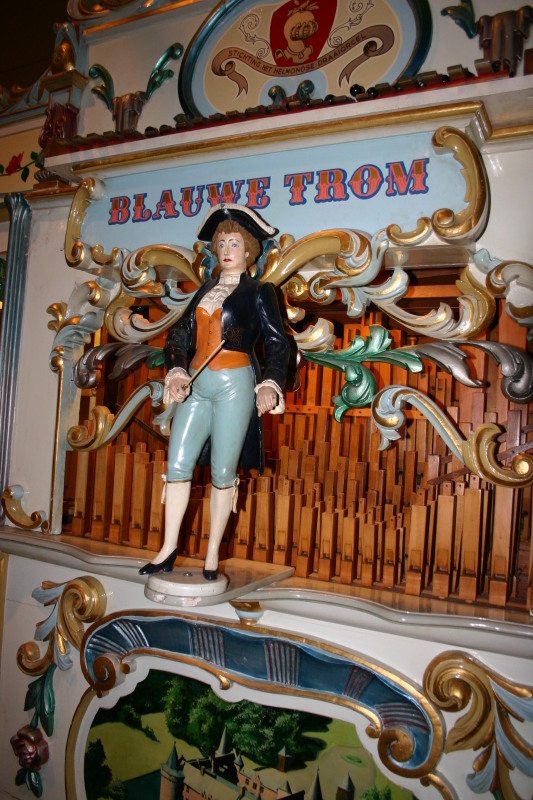 A really lovely example of mechanical music in Holland over the years. 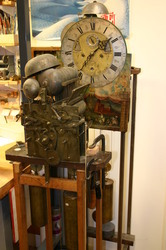 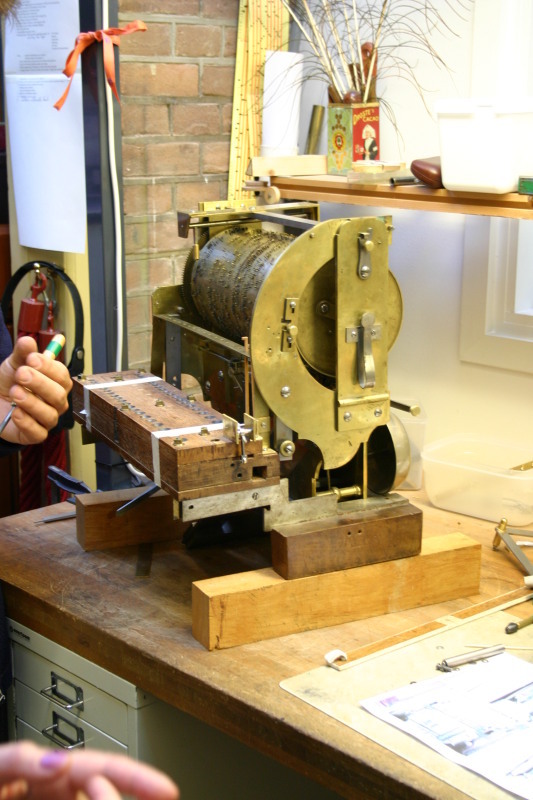 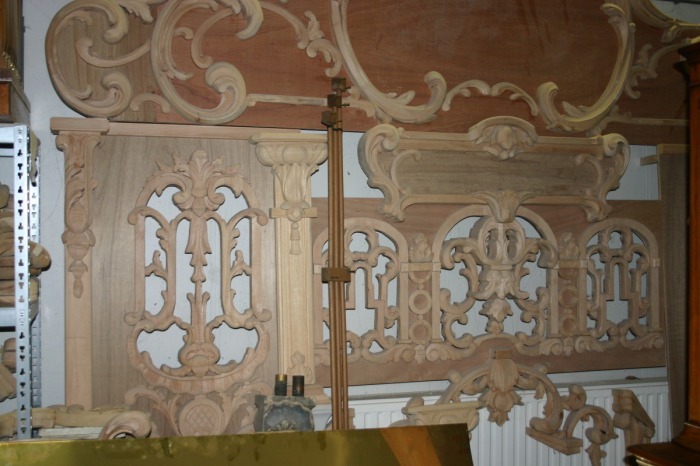 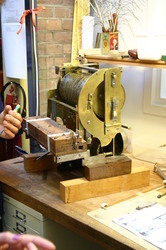 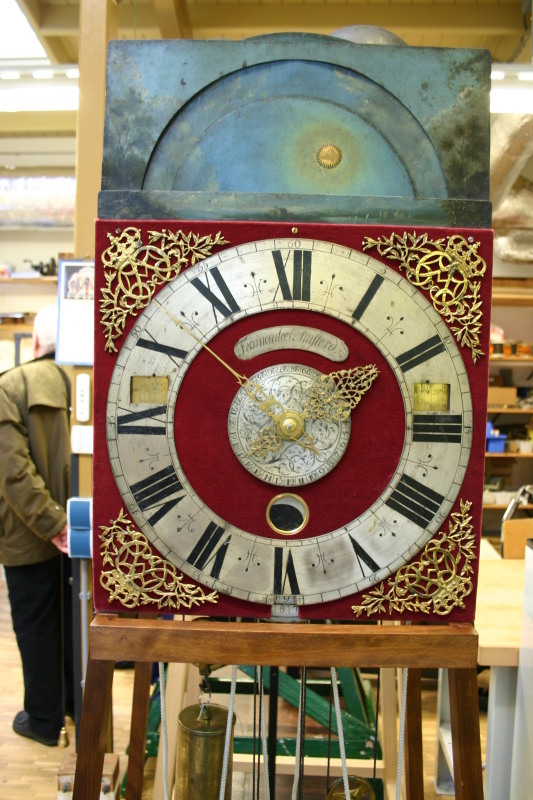 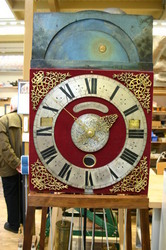 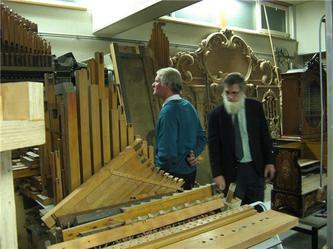 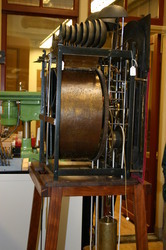 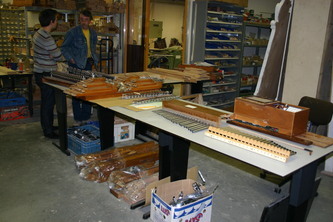 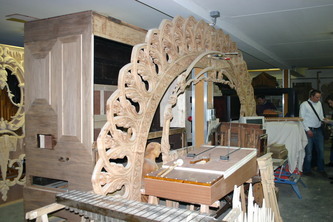 We also got the chance to have a stroll though town to view the workshop, split into organ repair and a clock workshop. As we strolled back we were able to hear the grand town clock play us a tune on the hour, as we were told by our museum guide that in the clock tower, a barrel mechanism is used to strike the bells. 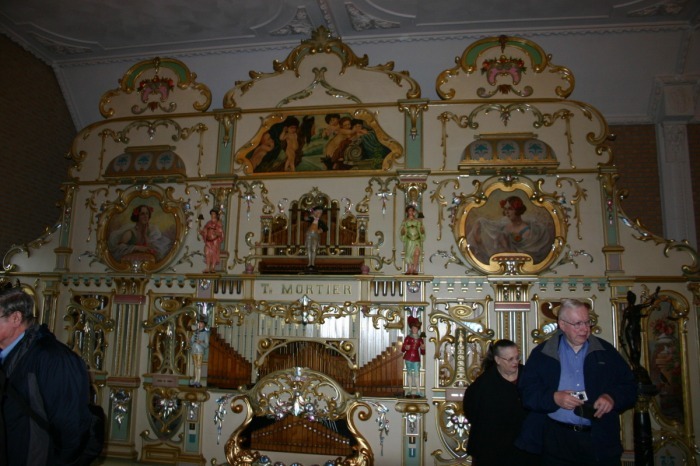 It was a really lovely day, as we had as much time as we wished to enjoy the instruments alone, as the collection is traditionally closed on Monday, meaning a special opening just for the MOOS Tour. Now Monday evening was something we were all really looking forward to. 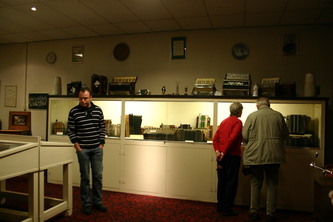 A visit to the Kunkelsstichting in Haarleem. 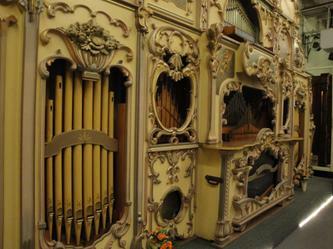 This really is an outstanding collection of mechanical organs, that was forced to move out of town to an industrial park about 5 years ago by the local council. 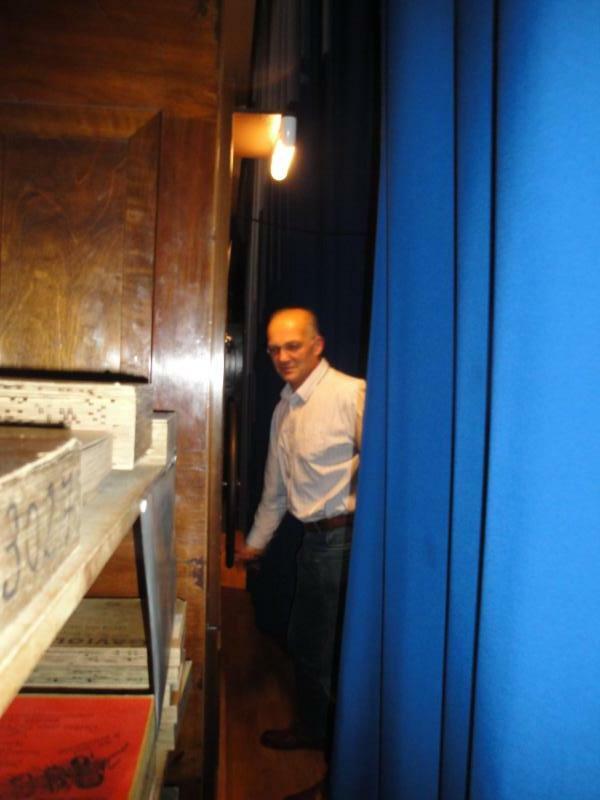 A group of volunteers have worked tirelessly to transform a warehouse unit into a hall suitable to display a collection of organs, including a catering area and posh toilets, meaning its ideal for hiring for a bit of a party. Earlier on in the year, you will remember hearing there was a fire in the building next door to the museum, and it was a very lucky escape for the instruments within the collection, as they only suffered minor smoke damage and being covered by an oily residue. 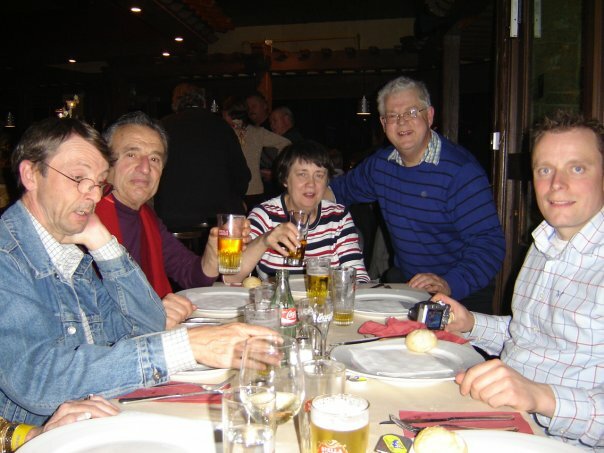 However, to restore the organs back to their former condition, months of work was undertaken by the small team of volunteers who have certainly performed miracles. A true credit to all who work there. 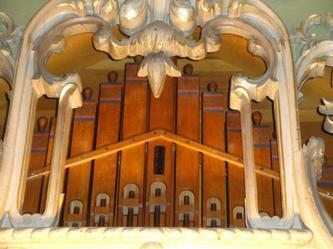 We were also amongst the first to hear the now finished Kunkels organ, which just sounded magnificent. 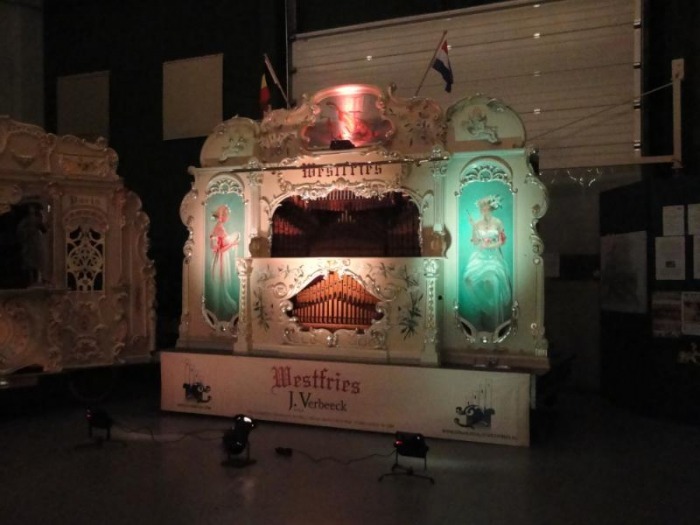 We had such fun, singing and dancing to all the mechanical organs, and later in the evening, trying to hand turn some of them (I believe its the De Grote Blauwe that is famous for having caused 3 heart attacks in its working life on the streets. 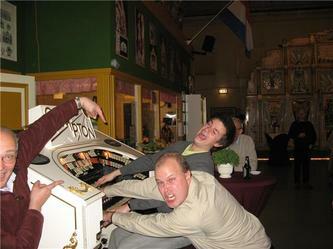 I avoided playing that one.) It was also such a lovely opportunity for us to meet new continental friends, as well as have a natter to old pals, including famous music arrangers Hiddo Van Os, Marco Hage, and Jan Kees De Ruijter. 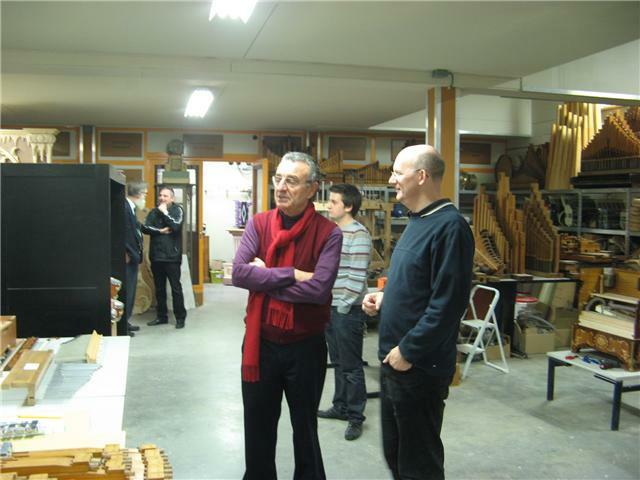 Tuesday came too soon, our going home day, but on the way to the ferry, we stopped off at the workshop of organ builder Elbert Pluer in Bussum. It was fascinating to see all the stages of organ building from the pile of wood to the finished 'De 5 Prominenten', a street organ that has just been finished in Elberts works. The sound and craftsmanship did not disappoint, truly stunning. Congratulations need to be offered to Peter Craig who works tirelessly to keep our connections alive in these places. Where else would you get the opportunity to have a nose round some of the places we have visited. Also Linda and Boz from History in Harmony, who manage to organise the whole things, and carry the weight of our enjoyment on our shoulders! There is no other tour company in the world who would be willing to organise such a trip, never mind do it so well. 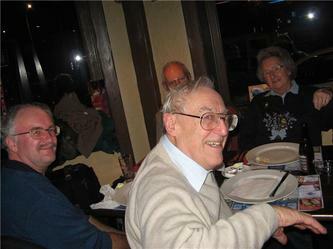 We need to support the MOOS tours because one we have lost them, they will never return. It was a truly social experience where everyone on the coach met new people, spent time with old friends and had great fun. 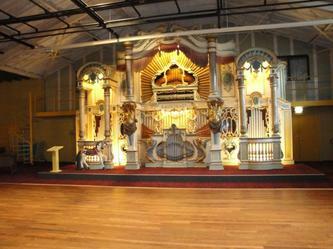 All all this for £325 including all the entrance into the attractions, breakfast and evening meal. Incredible value. 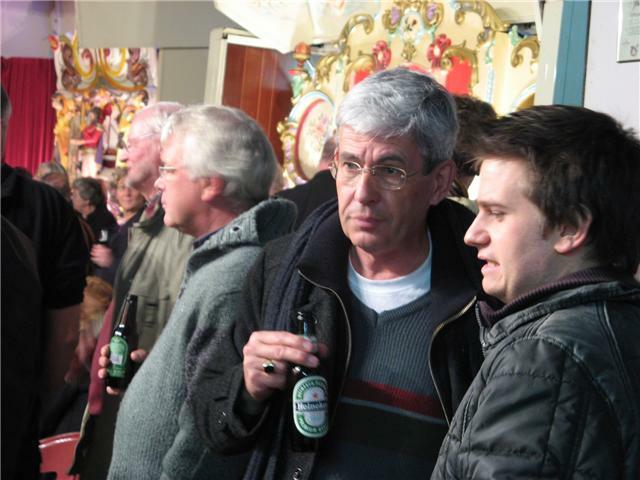 So we will see you on the coach next year?